Lowering the suspension of your motorcycle using lowering links is a very cost efficient to reduce seat height and indeed a proven method on the drag-strip to get quicker off the line. Why buy Lust Racing lowering links? Did you know that the suspension linkage drop-links are probably the most stressed component on your bike? Yes, That's right! This is why you only should fit top quality links on your bike. Lust Racing makes their links in forged steel and they are stronger than the standard links that they replace. 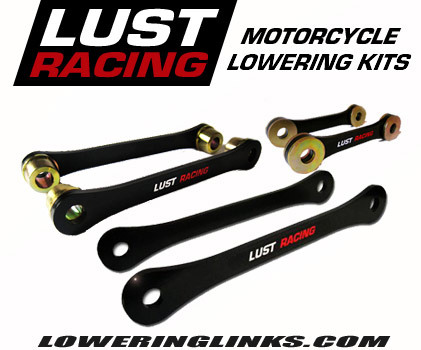 Lust Racing makes suspension linkages mainly for racing use, but there is no reason why they cannot be used on road, they are dimensioned to last the lifetime of your bike. Did you know that most other lowering links sold on the market are made in aluminum? The problem is aluminum cannot take the stress in the long term and the link holes en-longs until the links suddenly fail. Think about it, and think again. Do you really want to save a few bucks and end up with links that may fail when you can get genuine Lust Racing steel lowering links to this competitive price. Steel suspension links are stronger than standard links. Reduces the seat height of your motorcycle. Lower center of gravity, easier to handle the bike. Better traction means quicker 60ft times and faster starts off the line - this is why drag racing bikes are lowered! Great modification for shorter riders, now you can reach the ground with both feet! My GF is very happy now she can reach the ground with both her feet! Very helpful guys, and great parts. I would defo recommend this modification to others! My bike sits nicely now. Big thank you guys! Copyright © 2013 2014 2015 2016 2017 2018 www.LoweringLinks.com. All Rights Reserved. Trade marks are used for reference only and belong to their respective owners. The use of the trade marks does not imply any affiliation, recommendation or endorsement o the products by the respective companies, Honda is a trade mark of Honda Motor Co Ltd, Kawasaki is a trade mark of Kawasaki Motors Corp., Suzuki is a trade mark of Suzuki Motor Co, Triumph is a trade mark of Triumph Motorcycles Ltd, and Yamaha is a trade mark of Yamaha Motor Co. Lust Racing is a trade mark of Lust Racing Ltd, www.loweringlinks.com offer genuine Lust Racing products and have the written permission from the directors of the company for use on this web-site.